When I think of Lagunitas Brewing Co., I think of big, hoppy, flavorful brews. So I was surprised and intrigued to see a new “light” or “session” IPA from Lagunitas at my local liquor store yesterday. I grabbed it immediately. Obviously. The idea of a light IPA is an odd one. IPAs by definition are big brews with higher-than-average ABVs. And because the amount of alcohol in a beer directly influences its calorie content, IPAs generally aren’t considered low-calorie or light beers—quite the opposite really. I don’t think DayTime IPA is really supposed to be a low calorie brew; it’s meant to be a low ABV IPA that you can drink with lunch and not get too buzzed. And it’s meant to be a “session” beer that you drink one after another, which isn’t usually the case with big IPAs—unless of course you want become extremely inebriated. DayTime IPA has an ABV of 4.65, OG 1.042 and 54.20 IBU. It has 140 calories per 12 ounces, according to Ratebeer.com, compared to 180 calories in Lagunitas’s standard IPA and 110 calories in a Bud Light. I poured the brew into a tradition pint glass with some gusto, but its head didn’t foam up as much as I would have liked or as much as I expected it to. In fact the brew is less carbonated than most IPAs, which isn’t necessarily a bad thing. It just caught my eye. 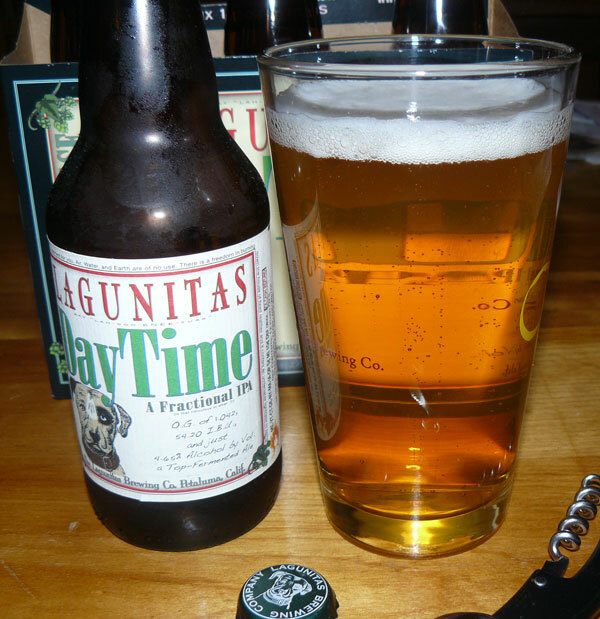 Lagunitas DayTime IPA has a nice, clean hoppy aroma. And when I swished the first sip around my mouth a bit before swallowing, I was pleasantly surprised with how potent the hop flavor was. It’s floral and fresh, crisp and clean, with a malty finish and clear faded-gold color. The brew tastes great, but it lacks something in body, like most light beers; the bitter taste doesn’t linger and after a minute or two, it’s gone. Overall, I like this light, session IPA, but it is a bit off-putting. Maybe I’m just not used to light IPAs, but something is lacking with DayTime IPA. 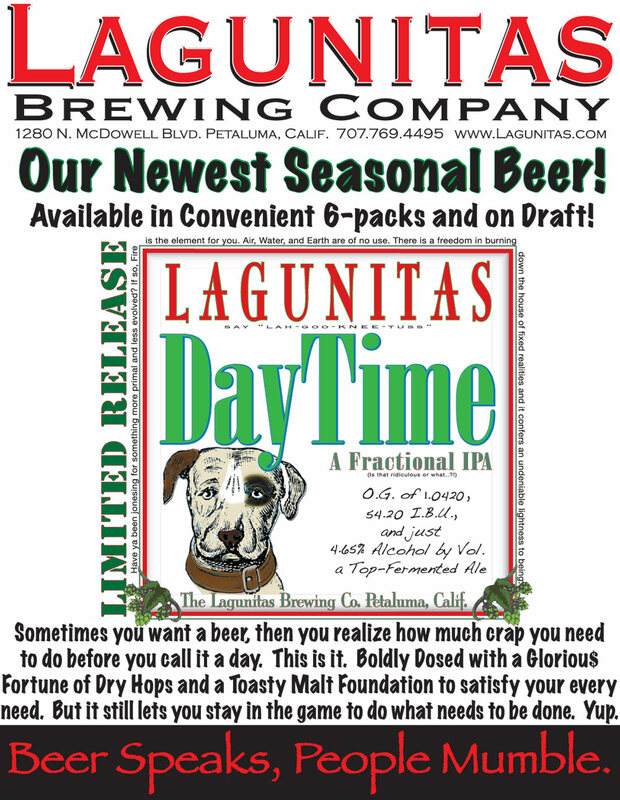 If I was counting calories and still wanted a hoppy beer, I might go with Lagunitas DayTime again. But when it comes to IPA, I don’t cut corners, and DayTime tastes to me like a compromised IPA. The concept of light IPAs has me wondering if we’ll start to see light- or session-versions of other popular styles, such as stouts and porters, in the future…and whether or not that’s a good thing. Lagunitas DayTime “Fractional” IPA gets a 6/10 on the Urban Beer Nerd scale. It is on store shelves now, and I paid $10.99 for a six pack. Visit Lagunitas’s website for additional information. nice review… where i can buy online? Thanks. I don’t really buy beer online so I’m not sure. I also haven’t seen this beer in stores for a few months now. It could be a seasonal release.